I suspect this problem isn’t limited to just managing CIFS shares on NetApp’s. I bet if you’ve got a Windows File Server and you’re trying to edit NTFS permissions on shares via a Windows 2008 Computer Management MMC you’ll get this error message. In our case we’ve got a NetApp FAS2040 joined to our new AD forest with a few CIFS shares on it. In this new forest we’re using Windows 2008 R2 domain controllers and our forrest is set to a 2008 functional level. When we want to manage the NTFS permissions of CIFS shares exported from our old NetApp FAS2020 in our old forrest (which is at a 2003 functional level with 2003 domain controllers) we’d typically login to a Windows 2003 server, load up the Computer Management MMC and connect to our NetApp. This shouldn’t be happening. The account I’m using is a Domain Administrator and the Domain Admins group has been added to the NetApps local Administrator group. 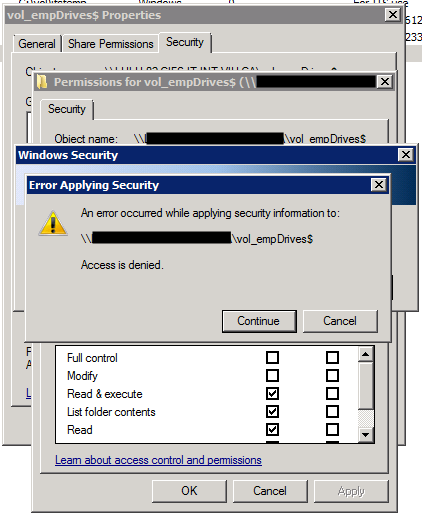 If you click ‘Cancel’ all the way out and then go back and view the NTFS permissions it will turn out that the changes did take effect despite the “Access Denied” error message. For some odd reason I thought to try using a Windows 2003 Server from our old forest to manage the NTFS permissions. It worked perfectly with no access denied error. What gives? Microsoft doesn’t explicitly state this but to “solve” the problem just create an empty folder, a blank text file or anything in the share first and then edit the permissions… or you can fire up a Windows 2003 Server and just use it’s MMC. Posted in NetApp, Windows Server. A disk_sanitization site license has been installed. Here I’ve got 13 disks in aggr0 and the 14th acting as a spare. I need to delete aggr0 to free up the disks to be sanitized. netapp> aggr offline aggr0 Aggregate 'aggr0' is now offline. netapp> aggr destroy aggr0 Are you sure you want to destroy this aggregate? yes Aggregate 'aggr0' destroyed. Aggregate 'aggr0' is now offline. The disk sanitization process has been initiated. You will be notified via the system log when it is complete. Thu Apr 19 11:10:41 PDT [disk.failmsg:error]: Disk 0a.20 (XXXXXXXX): message received. Thu Apr 19 11:10:41 PDT [disk.failmsg:error]: Disk 0a.19 (XXXXXXXX): message received. Thu Apr 19 11:10:41 PDT [disk.failmsg:error]: Disk 0a.18 (XXXXXXXX): message received. Thu Apr 19 11:10:41 PDT [disk.failmsg:error]: Disk 0a.17 (XXXXXXXX): message received. Thu Apr 19 11:10:41 PDT [disk.failmsg:error]: Disk 0a.16 (XXXXXXXX): message received. This will add the sanitized disks to the spare pool. There are a few options you can customize when ‘disk santize’ command. disk sanitize start [-p pattern1|-r [-p pattern2|-r [-p pattern3|-r]]] [-c cycle_count] disk_list -p pattern1 -p pattern2 -p pattern3 specifies a cycle of one to three user-defined hex byte overwrite patterns that can be applied in succession to the disks being sanitized. The default pattern is three passes, using 0x55 for the first pass, 0xaa for the second pass, and 0x3c for the third pass. -r replaces a patterned overwrite with a random overwrite for any or all of the passes. -c cycle_count specifies the number of times the specified overwrite patterns will be applied. The default value is one cycle. The maximum value is seven cycles. disk_list specifies a space-separated list of the IDs of the spare disks to be sanitized. -p pattern1 -p pattern2 -p pattern3 specifies a cycle of one to three user-defined hex byte overwrite patterns that can be applied in succession to the disks being sanitized. The default pattern is three passes, using 0x55 for the first pass, 0xaa for the second pass, and 0x3c for the third pass. -r replaces a patterned overwrite with a random overwrite for any or all of the passes. -c cycle_count specifies the number of times the specified overwrite patterns will be applied. The default value is one cycle. The maximum value is seven cycles. disk_list specifies a space-separated list of the IDs of the spare disks to be sanitized. Someone not following your naming convention? We’ve got two filers (netapp1 and netapp2) and I want to rename a SnapMirror target to follow our new naming convention. We’re going to prefix the volume ‘sampleTarget’ with ‘st_’ to designate it as a SnapMirror Target. There are two sets of instructions in this post. Follow the first for migrating regular volumes. Follow the second set for migrating SnapMirror Targets. To keep things simple I use the original volume name and append ‘NEW’ at the end for the new volume and rename the original volume and append ‘OLD’ to the end of it. In the below examples I’m going to move a 100gb volume called ‘shares’ from aggr0 to aggr1. 8. If your volume was exported or configured as a CIFS share verify functionality of that export or share. They should still work. Need to switch your root volume (vol0) to a different aggregate on a NetApp? WARNING: IF DONE INCORRECTLY THIS COULD RESULT IN YOUR NETAPP BEING UNABLE TO BOOT. PROCEED ARE YOUR OWN RISK. You may want to consider speaking with NetApp directly instead of following these instructions. They can be reached at 1-888-463-8277 if you are in Canada or the United States. netapp> vol size vol0 vol size: Flexible volume 'vol0' has size 30g. vol size: Flexible volume 'vol0' has size 30g. netapp> ndmpd status ndmpd ON. No ndmpd sessions active.